In the second week of February I went to a field visit as a part of my usual work that covers visiting several schools – both primary and secondary – along with some other assignments. The primary schools that I visited are run by BRAC Education that offers education in a different setting and style making the teaching learning situation much more enjoyable than the schools scattered across the country. The secondary schools I usually visit are run by the community and financed by the government in the form of MPO. I am not sure whether the readers will be surprised to learn the answers that I received by asking a few simple questions to students of class nine. They answered that an acute angle is 90 degree. Village schools give emphasis on teaching grammatical items and so I asked them whether they could make a tag question of the sentence already written on the board. Again, not a single student could do it. Finally I told them to make the sentence ‘there are sixty seven students in our class ‘that also came with the same ‘no response.’ It might make you astonished to hear that the teachers who accompanied me to the class said, ‘Sir, translation is not in their syllabus. They are not taught translation’ hinting that they are not taught translation. What would be your answer dear readers! 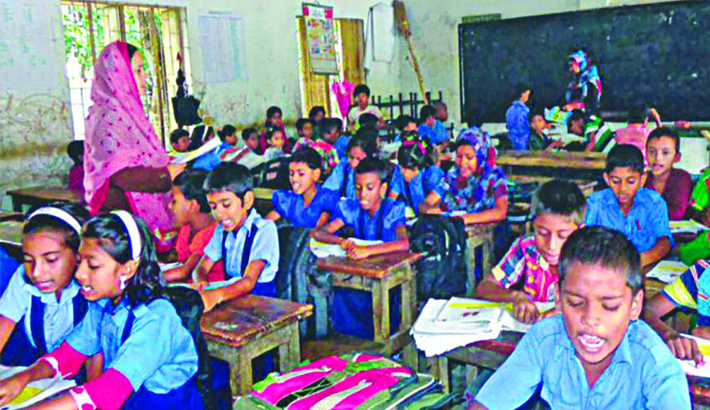 Getting back to Dhaka from the tour I was going through newspapers and a news report drew my attention that tells, ‘Primary and Mass Education Secretary paid a sudden visit to a char area to see for himself how the primary schools run their schooling activities. He visited seven schools where no teacher was seen in 6 schools. In one school a girl having eight pass qualification was conducting classes that revealed that she has been paid Tk 2500 per month by five teachers of the school who don’t come to the school to conduct classes. They come maybe once a month just to put their signature on the attendance sheet. Real teachers come to the schools once a month just for one hour to put their signature. Even some school remains closed and kept under lock and key during schools hours. Several questions necessarily come to our mind along with the question `what do the education officers of upazila, district and division levels do’. What are the duties of our education officials working in different tiers of administration including the respective upazillas? Again, it also comes to mind what the public representations do in this area. Don’t they think that education is necessary for the children of these areas? Without giving them education can we expect to change their lot, society and country? It is learnt that in char, haor and hard to reach areas there are 20 thousand 52 government primary schools that accommodate one lack 10 thousand 879 teachers and 36 lakh students. The government offers stipend, books free of cost and some facilities to the students that calls for appreciation. The teachers of these schools enjoy full government staff status but their presence in the schools and teaching in the class does not happen. It is also learnt that the teachers establish an unethical relation with the education officials and get their documents signed by them. In 2018 PECE and Ebtedai examination 30 lakh 95 thousand 123 examinees were supposed to appear but one lakh 60 thousand 168 students did not take part in the examination. We don’t know what happened to them. Is this not the duty of the Primary and Mass Education Ministry to inquire about these missing or dropped-out students? Where are these children and what happened to them? This is an overall picture of the country. What is the situation of char, haor and hard to reach areas children? Sometimes we see some non-governmental organisations conduct some studies and research and publish reports that actually should be done regularly by the government agencies and departments, but that hardly happens. We know a school is the focal centre for children to receive institutional education and they are supposed to be sent to school when they reach the school going age. When such deplorable situation prevails in our government primary schools, where shall we send our children to receive education? A school is the running stage to teach social, cultural and mental wellbeing and development of young learners. Questions arise could we have established such kind of schools for our future generation? Schools play multi-dimensional role to develop the overall aspects of the children. We must keep in mind that state need to establish such kind of schools and employ teachers of that stature for building a prosperous generation and nation. Teachers of this level must be more dedicated to developing a child-friendly environment to attract the young learners. According to the advice of UNESCO, there must be at least one teacher for each class in the primary level that tells that six teachers are necessary in each school as each government primary school attaches a pre-primary section. But we see there is only one teacher in many schools. `Annual Primary School Census of 2017’ shows that we have 64 thousand 122 government primary schools of which 38 thousand 856 are run by less than six teachers, 22 thousand 527 schools are run by less than four teachers. There are three teachers in eight thousand 564schools. The existing teachers may also go on leave or become sick or on maternity leave. Now let us think how the schools are run and what is the situation of our tiny tots?